There are hundreds, maybe thousands of different types of mechanical flange protectors on the market today. They are made from plastics, plywood, steel plate and many other materials all trying to achieve one common goal; to protect the raised faced surface of a flange against mechanical damage. Precision Piping Products (P3) reviewed all the options in the industry and decided to go a different direction than the industry norms. We wanted to find a material that was lightweight like plastic but rigid with high impact protection like plywood and steel plate. P3 developed flangeBUMPER® using a strong, rigid, lightweight laminate, manufactured to industry specifications of pipe size and pressure class that has proven to give outstanding performance and incredible impact protection. FlangeBUMPER® is weatherproof, waterproof, will not warp, will not crack or split. Once installed on your flanges, they give protection equal to or better than anything on the market. When you combine our P3 flangeDOTS™ with our flangeBUMPER® you get a system that will preserve your flange faces from moisture, air infiltration and rust. It seals your pipe spools and vessels and retains any corrosion inhibitors you have installed. flangeBUMPER® can attain many of the characteristics of a blind flange without using a spiral wound gasket, at a fraction of the cost and weight. 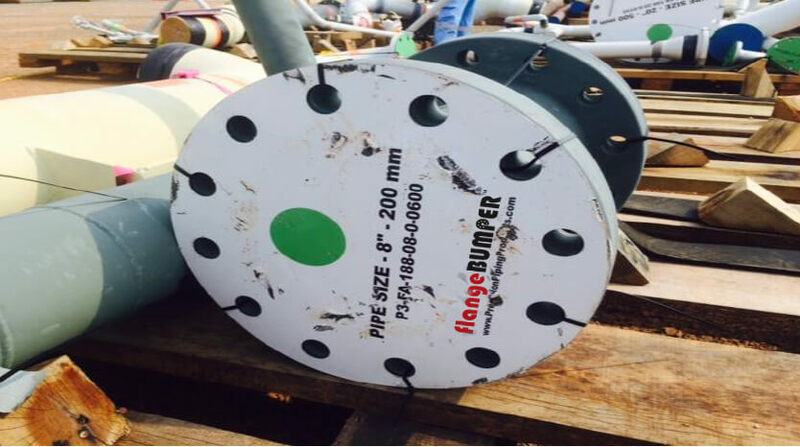 flangeBUMPER® meets all the requirements for shipping abroad. Visit our Preservation page to learn more about combining this product with some of our others for the ultimate level of protection and preservation. If you are looking for extreme flange and asset protection without breaking the bank, you just found it. Call us today for more information and pricing. Be sure to check out our exhaustCOVERS™! It’s a flangeBUMPER® with a built in neoprene gasket.